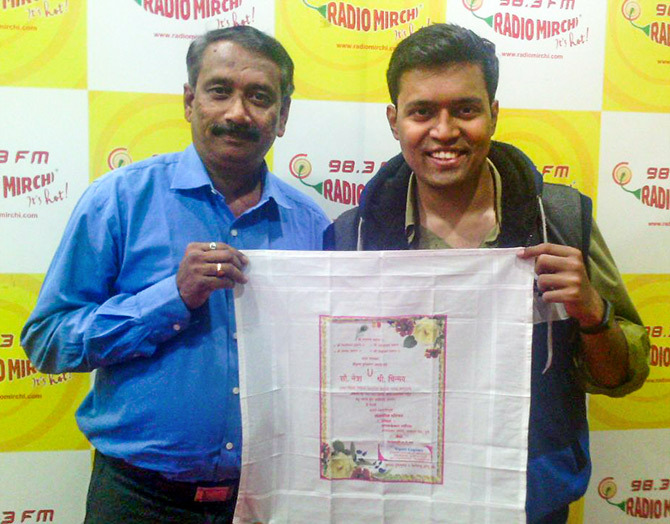 Uday Gadgil's idea to print his daughter's wedding invitation on cloth (rumaal patrika) has become a viral trend that has inspired over 200 young couples across India to copy the idea in the past 18 months. Three years ago, when Pune's Uday Gadgil was planning to get his daughter Netra married, he wanted a minimum waste wedding. Gadgil, now 52, who operates Ugam Copiers, a paper printing business in Pune, Maharashtra pondered over the thought of printing 500 wedding invitations to welcome friends and relatives. He didn't want to make the mistake most Indians make -- printing and wasting paper. "Every day, millions of people print invitations on fancy paper which is practically not even valid for a day. After the wedding, the paper is wasted, thrown away in a dump," he tells Divya Nair/Rediff.com over the phone from Hadapsar, Pune. 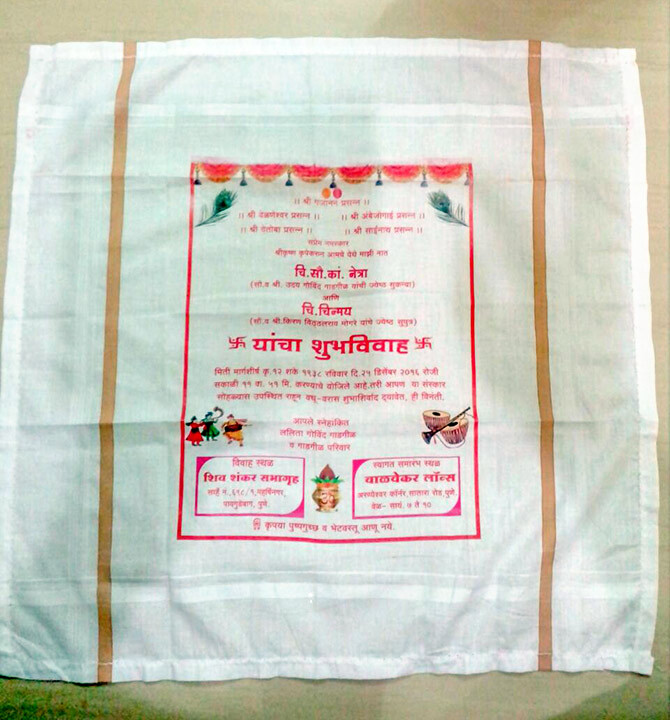 It was Gadgil's idea to print a wedding invitation on a piece of nature-friendly fabric with temporary ink so it can be used later as a napkin. Gadgil who doesn't mind being called a Modi bhakt says he was deeply inspired by the prime minister's Swachh Bharat Abhiyaan at the time. He'd been itching to do something that would reduce wastage and also help save the environment. 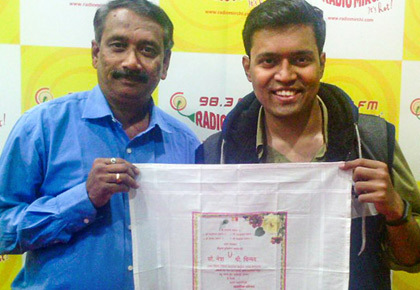 Although Gadgil had been working on the idea of rumaal patrika (cloth-based invitation) since 2014, he executed it for the first time at his daughter's wedding to set a precedent. "When most printers turned down the idea or said it was not feasible/inconvenient, I did my own research and came up with a way to design the invitation on a piece of cotton in digital with four colours. I wanted the ink to be temporary because people won't use a napkin with a wedding invitation printed on it. The ink had to go away after washing and cotton seemed like a good choice. In a Hindu wedding, we give vastra to our guests. A wedding invitation on cloth would be like a gift from us with a message of responsibility. It fulfilled all my purposes." There was one major drawback -- it wasn't cost-effective. But Gadgil didn't give up. IMAGE: Uday Gadgil innovated the idea of digital printing in four colour with temporary ink so the napkin can be reused. The initial cost of printing the invitation for his daughter's wedding was Rs 50 (inclusive of fabric and printing cost). When he showed the invite to his relatives, some of them were shell shocked and apprehensive about the idea. 'Arre, he kay?' (What is this?) 'Asa amhi kadhi kuthe pahila nahi' (We haven't seen something like this) people commented, he says. Gadgil admits to being frustrated initially but was motivated with time. On December 18, a week before his daughter's wedding, a media professional requested him to be interviewed. Despite turning his request down because he was busy with the preparations, the reporter insisted and covered Gadgil's story while he was distributing the cards. Not just Gadgil, neither his daughter or wife expected the family wedding to be the talk of the town. "Every girl wants her wedding day to be special. As a father, I think I was able to make it more than memorable," he says. Thanks to news channels and social media, the news of this unique idea soon spread across India and even reached prime minister Narendra Modi to whom he'd sent the invite. 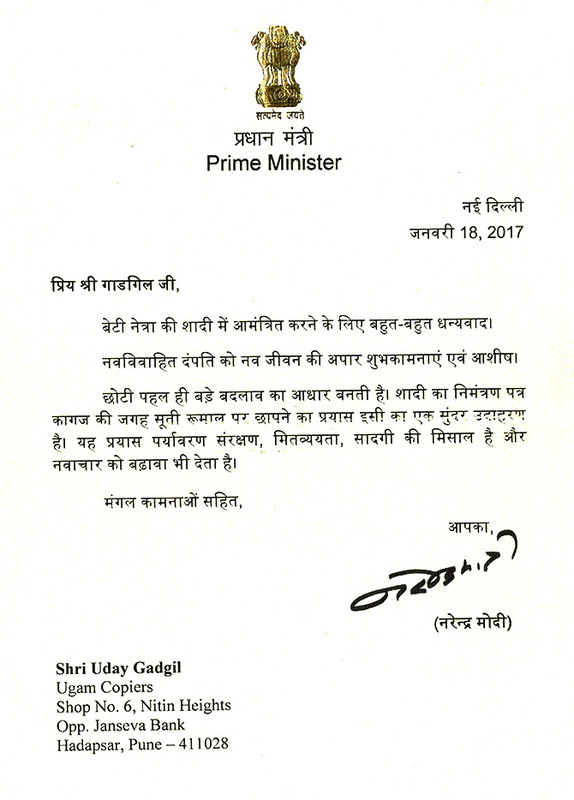 IMAGE: In January 2017, nearly a month after Netra's wedding, prime minister Narendra Modi acknowledged Uday Gagdil's daughter's wedding invitation and appreciated his efforts in saving paper, contributing to the environment and setting an inspiring example. In the past year and half, Uday Gadgil has managed to print over 200 wedding invites at his Pune office serving and delivering client requests from the US to Jharkhand. Although he's been successful to bring down the cost to Rs 25 per invite, he says people don't believe when he says that he's not doing this for profit. "I have a printing business which takes care of my daily needs. This initiative is my contribution to society. The cost covers the fabric and printing cost I incur, not a paisa more than that." 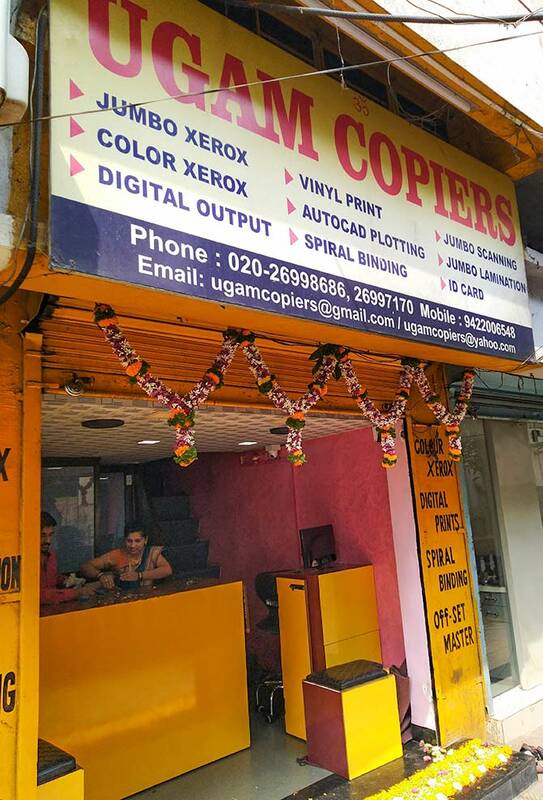 IMAGE: Uday Gadgil has been operating Ugam Copiers in Pune for over 25 years now. Some of his clients have turned down the idea because the ink blots a little on the napkin and the lettering isn't as clear as one would get on a printed paper. "One of them told me that he wanted to place an order for 1,000 invites and asked if I could bring down the cost. When I said No, he gave up," Gadgil shares. He is curious to try out new ways to bring down cost if it will encourage people to give up on wasting paper. Besides cost, the other drawback he faces is people spreading false information. "Social media has its pros and cons. Recently, I came across a post which suggested my printing press should be raided because this project was a scam. That I was getting the fabric at Rs 5 and making a sizeable margin by hiking the cost. That is just not true, and it has affected people's mentality. But how many mouths do I shut? I have to focus on doing my work and having a transparent communication with my clients," he said. In his message to readers, he suggests that educated people should try and question some existing practices and avoid what is unnecessary. "Think about it. Is it absolutely necessary? Is it adding any value? Can you do something to replace it, help nature and society? If you can reuse paper or replace it with something else, you can at least save cutting down of trees to some extent," Gadgil suggests.